Welcome to the inaugural Schueco Excellence Awards for Design & Innovation 2014, published in association with the RIBA Journal. Faced with a field of hugely varied buildings, all using Schueco systems, it was noticeable that the most intriguing projects showed the transformational power of the cladding system. The panel of sometimes demanding critics, Paul Monaghan of AHMM, DSDHA’s Deborah Saunt, past RIBA president Sunand Prasad of Penoyre and Prasad, and myself, had warm words for the best: ‘handsome and elegant’, ‘fresh’, ‘simple and unpretentious’ and even ‘exquisite’. Winners in two of the most hotly contested categories – Manchester School of Art (Education) and Bridgegate House (Commercial) – used Schueco systems to revive flagging buildings from the 1960s and 1970s respectively, pulling them up an astonishing number of notches in thermal performance with a new envelope. Not only that, but the new façades signal a new and stylish life for those buildings, giving a sense of pride to those who work and study in them. These two projects are not simple reclads. They both have a great deal of design thought put into them, from bespoke trickle vents to finishes in mirror backed glass, and stainless steel ventilation panels. This level of design is a reminder of the dedicated input and collaboration it takes from design team to specialist subcontractors and right through the supply chain to Schueco itself. You can see that demonstrated most clearly at Heathrow’s Terminal 2 where the wave forms of the huge roof have metres and metres of curving junctions between the aluminium and the Schueco skylights and Schueco FW 60+ curtain walling system – and it was all installed as the rest of the airport carried on its everyday business. 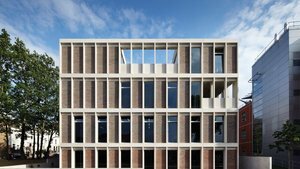 The Special Award was unanimously given to Ortus, a health education building designed by Duggan Morris that shows a practice going beyond its normal scope of services to construct a truly excellent building where every façade detail is tailored and considered. We need more buildings like this one. Eleanor Young is executive editor of the RIBA Journal. As a critic and a journalist she visits, interviews and writes about the most exciting buildings and people in architecture from Hadid to Holl. She was a founding director of architecture centre TransForm MKSM and is a board member of housing association Circle 33. Paul Monaghan is a director of Allford Hall Monaghan Morris, which he co-founded in 1989 with Simon Allford, Peter Morris and Jonathan Hall. His projects include Unity on Liverpool’s waterfront, Barking Central and Westminster Academy. He is currently on the Cabe National Design Review Panel and is a former chair of the RIBA Awards. Sunand Prasad co-founded Penoyre & Prasad in 1988 with Greg Penoyre. He was a founding commissioner of Cabe and was president of the RIBA from 2007-09. He is a member of the Mayor’s Design Advisory Group for London and the UK Government’s Green Construction Board. Deborah Saunt worked with Tony Fretton and MJ Long before founding the architecture studio DSDHA with David Hills in 1998. She was a guest professor at EPFL in Lausanne, Switzerland and currently teaches a diploma design unit at the Cass School of Architecture in London. Banner image: Ortus, designed by Duggan Morris Architects, photographed by Jack Hobhouse.